Low Slung Guns: A Hollywood Invention? A mixture of Hollywood cowboys and historical figures wore buscadero rigs, as you will see in the following images. 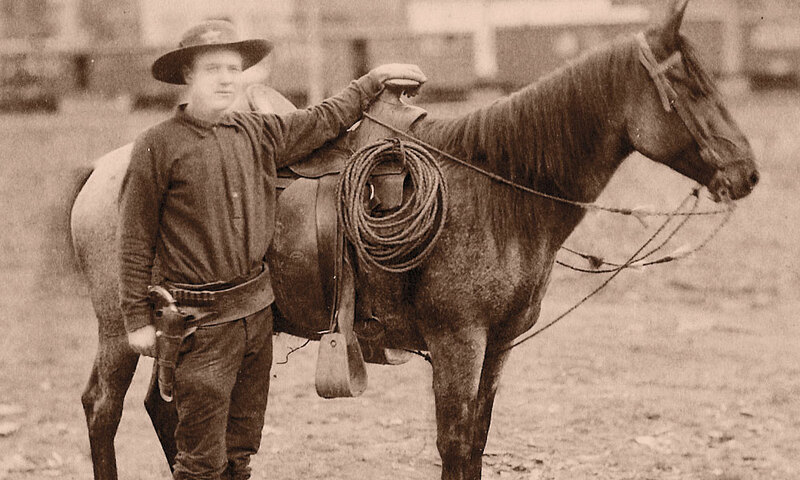 A lawman in Flagstaff, Arizona Territory, circa 1884. A popular misconception among some Old West re-enactors and wardrobe experts is that everyone wore their gunbelts high on their waists and that the low slung gun is an invention of Hollywood. “If one thing will ding a contender for the title of a historically accurate Western, it’s the dreaded buscadero. Purists hate the low slung holster with a passion that is hard to imagine if you’ve never been around a history buff, like Charles Bleile, who says, ‘Overall, I liked the [Kevin] Costner movie, but looking at those holsters was like having a pebble in my boot.’” wrote film history buff John Farkis, in his True West article arguing why 1993’s Tombstone got the look right versus 1994’s Wyatt Earp. Fort Huachuca Lt. Powhatan H. Clarke, in Arizona Territory, circa 1886. This judgment may be harsher than necessary. 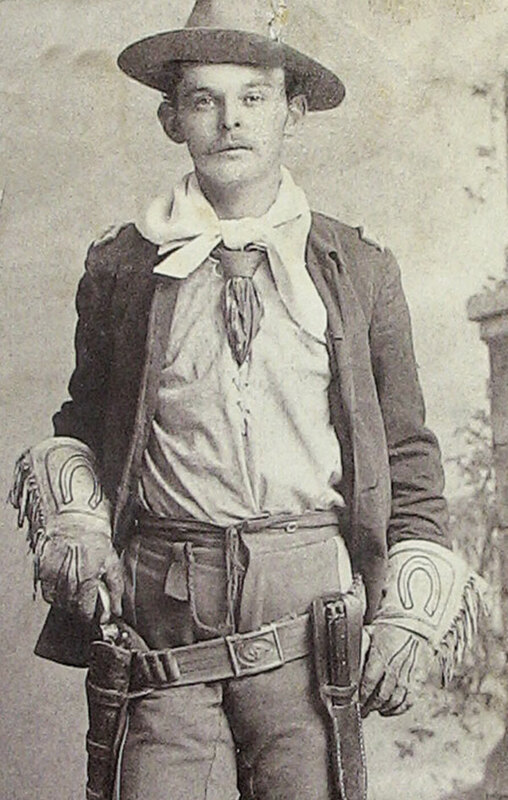 Yes, most frontier gunfighters did not walk around wearing extravagant buscadero rigs, which were holsters that hanged from the bottom of the gunbelts. But as the historical photos in this article prove, this was a style worn on the frontier. Even so, two of the buscaderos, the most famous being the one worn by Commodore Perry Owens (see p. 22), date from 1884. 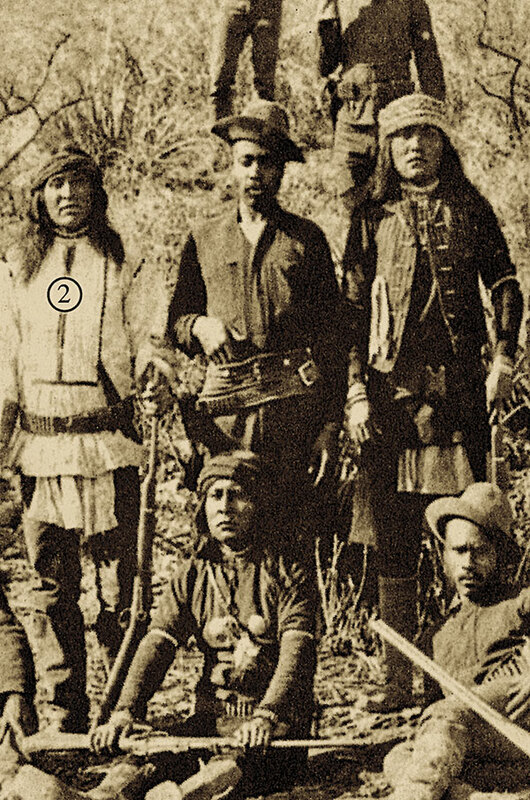 The other shows a Flagstaff lawman, next to his horse (top, far right; see close-up of buscadero in inset). 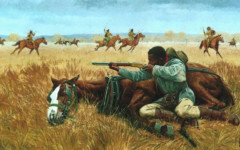 In that same decade, folks who wore a low slung gun included Lt. Powhatan H. Clarke, who served farther south at Fort Huachuca in Arizona Territory, and a buffalo soldier who served under Clarke. Clarke wasn’t wearing a buscadero rig, though; he lowered his Mexican loop holster over his gunbelt. A 10th Cavalry buffalo soldier who served under Clarke while in Arizona Territory, circa 1886. All of these examples point to the low-slung gunbelt possibly being a trend in Arizona Territory. These photos also demonstrate that some of our reverence for history is misplaced. We need to lighten up a bit regarding certain styles and gun usage. As with the case of the buscadero rig, Hollywood sometimes captured the outfit more accurately than we thought. While traveling through southern New Mexico and Arizona, I saw signs for “The Thing.” What is it? 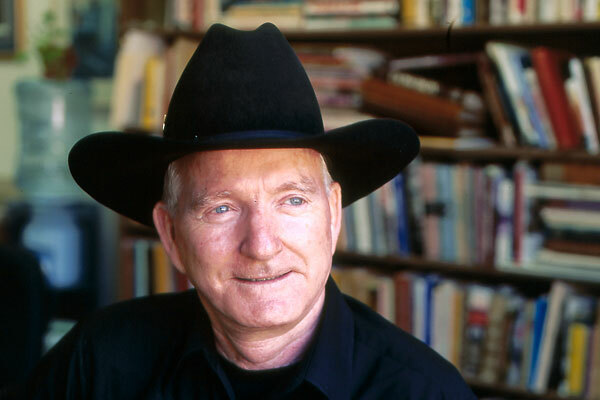 Britt Johnson One of the Old West’s greatest stories of courage, perseverance and family love was that of Britt Johnson’s quest to rescue his wife Mary and two daughters after their capture in 1864 by a war party of Comanche and Kiowa.